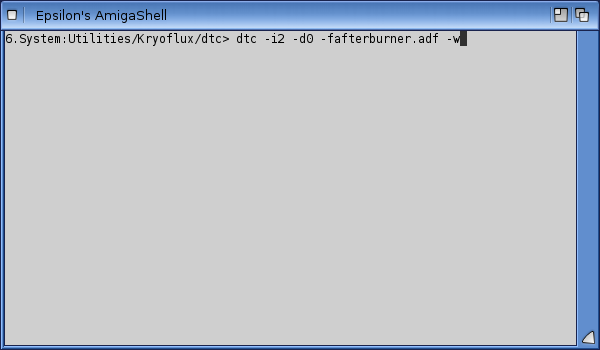 Today I wanted to take a look at the fantastic Kryoflux device, which now works under AmigaOS4 on the X1000. So what is Kryoflux? Basically it is a USB device that allows you to read/write floppy disk images to a real floppy disk, using a floppy disk drive connected to it. (you can read more about it here). 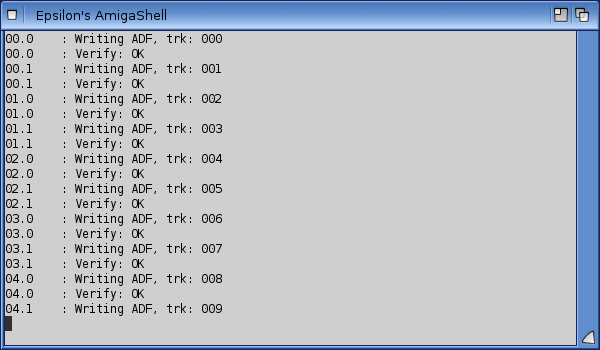 What makes it special for Amiga users, and more useful than the Catweasel I already use on the X1000, is the ability to write out IPF Classic Amiga disks, which are protected Classic Amiga disk images of original games. These cannot be copied using normal Amiga disk copy methods, but the Kryoflux can read the raw image out directly from the original Amiga floppy disk, which can then be converted to IPF and rewritten to blank floppy disks to provide a backup. For disks that are now up to 30 years old, this is a blessing as original protected Amiga games disks can be backed up using the Kryoflux. I purchased the Kryoflux back in late 2012, and used it on my Mac and PC. But now, I can use it on the X1000 too! There is no GUI front end available for AmigaOS4 version as yet, so it is used completely from the shell. I hope a GUI frontend is also written in due course, as it is a lot more user friendly. 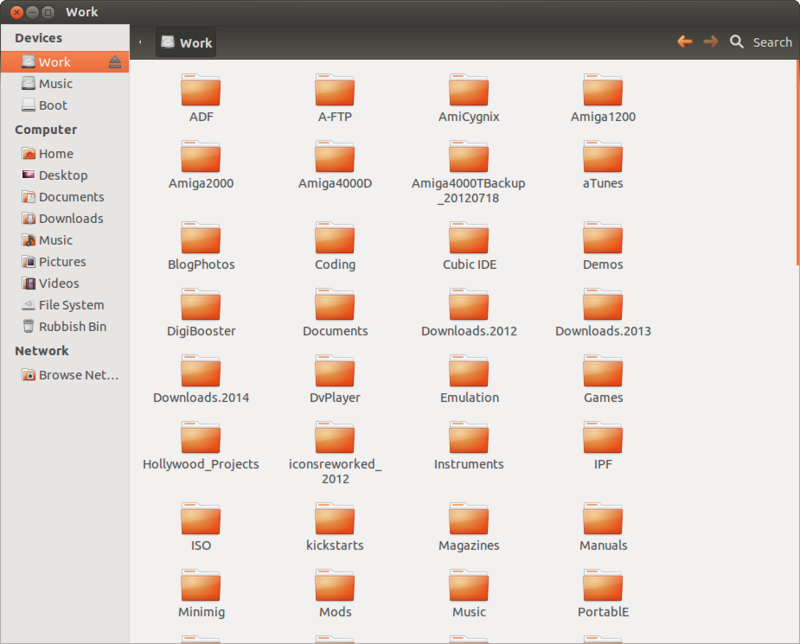 I created a Kryoflux folder under the SYS:Utilities folder, and then extracted the Kryoflux archive into it. Make sure that you copy the capsimage.device to the DEVS: directory to start with. I checked first and my existing version in DEVS: was v2.0, while this updated driver is version 4.2 (as below)! While doing this I was thinking I would like to source a Classic Amiga Commodore 1011 floppy drive, strip out the Amiga disk drive and disk drive external cable, and then replace it with the PC floppy drive and Kryoflux inside (with usb and power coming out the old drive cable hole) so it is self contained and easier to move around - not sure if it will fit or whether I need a 1010 drive casing - anyway, perhaps one day I'll get it! 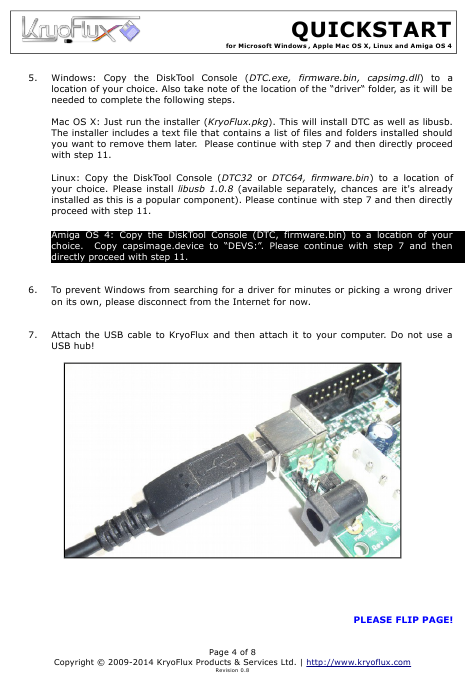 As per the instructions it is important to connect the Kryoflux via USB to the X1000 before powering on the floppy drive. Once this is done, I can then configure the drive in AmigaOS4. 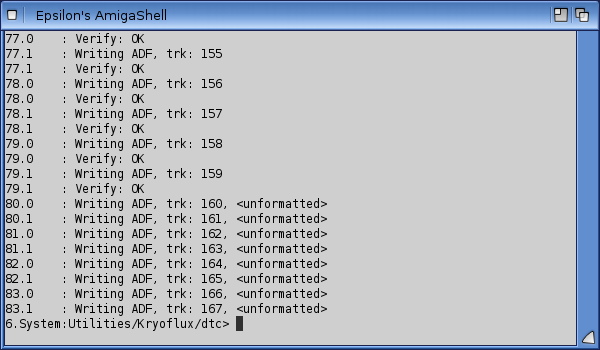 I put in a normal Classic Amiga floppy disk as I need to initialise the Kryoflux device and get it to detect from the floppy disk inserted how large the disk images need to be. So next we need to try out some disk writing. 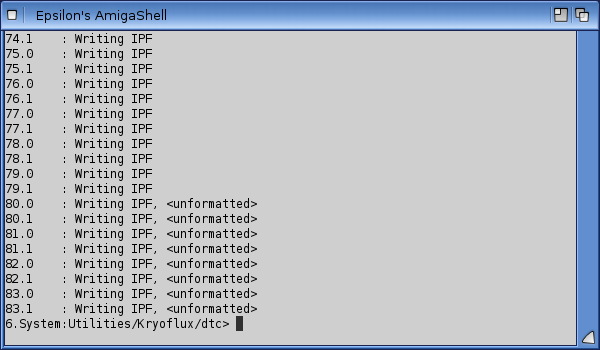 To start with, I tried an ADF image, and then an IDF image. I copied the files I wanted to the sys:utilities/kryoflux/dtc folder and renamed them to remove spaces in the filenames. I guess you don't have to do this but I couldn't work out how to get it to see files in folders or if the filename had spaces. Let me know if you work it out. -i defines the type of file, -d the floppy drive number, -f the filename, -w to write the image to disk. 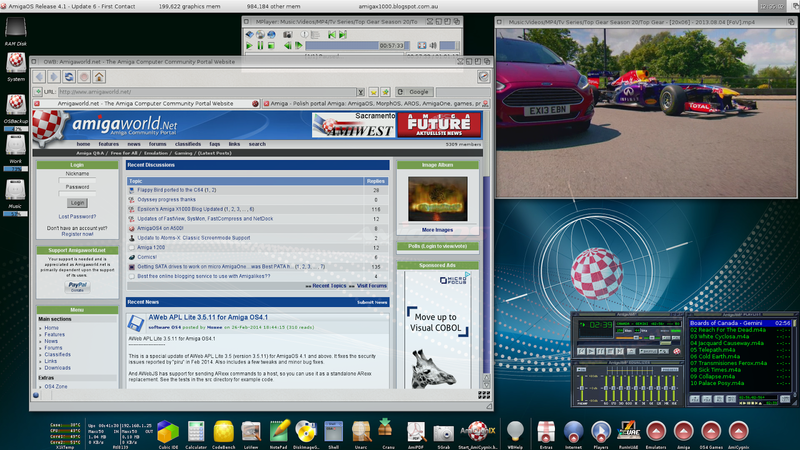 The A4000T runs AmigaOS3.9, has USB (Deneb) and PCI ports, PCI Network adapter, Dual TFT displays, Dual IDE ports on a Zorro card, Individual Computers scan doubler and PCI video card, PCI sound card for hardware MP3 playback (with Amiga standard audio mixed in), multiple CD/DVD drives and hard disks, Cyberstorm PPC/060, etc. I do have a Picasso IV Zorro card, so in theory I could just use one screen if I just used that, but the PCI video card provides higher resolutions and greater colour depth, hence the dual display. It was just as frustrating as the iPhone version....I guess that is good, right? I loved the title tune, a great retro Amiga throwback! Anyway, enough about that - easy to get carried away as an Amiga user of over 25 years! In summary, Kryoflux is a fantastic way to preserve and restore Classic Amiga disks, and I am very glad to be able to use it now on the X1000! Today I continue my look at Filesysbox NTFS with SATA HD on the X1000. In this 2nd Part, I look at the Ubuntu side after swapping my new NTFS hard disk as the new AmigaOS hard disk. If you haven't read Part 1, I recommend you do so here first. This Part 2 continues straight on from Part 1, where I was copying my files to the new NTFS volumes on the 1TB hard disk set up in Part 1. With the new 1TB Hard disk prepared with two AmigaOS4 partitions, one small boot partition, and all files copied across to the new NTFS Music and partitions, I then powered off the X1000, and swapped the Amiga hard disk supplied by AmigaKit with the new Hard disk. It is important that the new disk is swapped with the original AmigaOS hard disk, as the CFE expects to autoboot the hard disk connected to that SATA port ONLY. 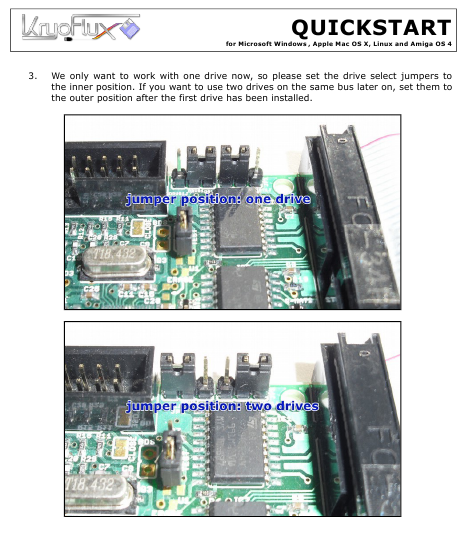 It is of course possible to boot AmigaOS4 off of another SATA port on the X1000, but it will not boot it by default. In that case you would also need to setup a menu item in the CFE and select it every time you boot. Some things I have found with having Work: on an NTFS volume. First, NTFS was implemented here using NTFS-3G file system is case sensitive. This was not expected! I found that this case sensitive support broke AmiCygnix under AmiagOS4 on the new hard disk. 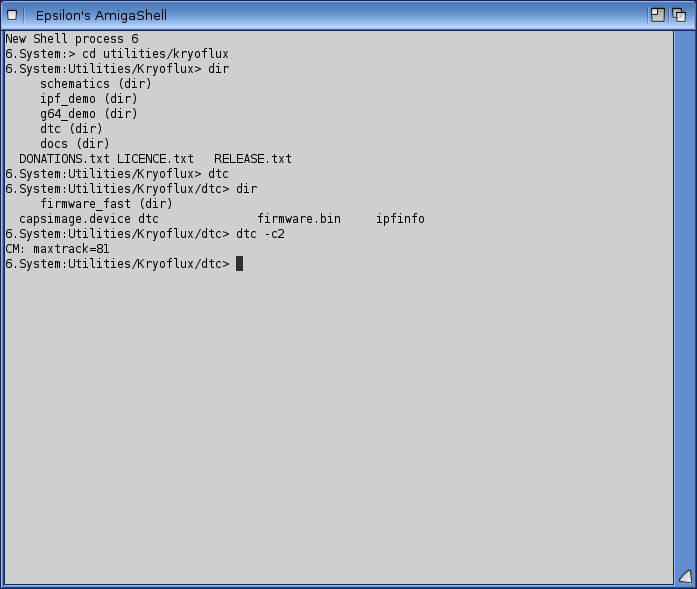 To fix this, I moved the AmiCygnix folder from Work: (NTFS) to System: (SFS2). I then edited the s:User-startup file to change the Cygnix: assign to the new location in System:AmiCygnix. After that, AmiCygnix worked fine. I expected this may happen, which is why I allowed extra space (10GB) on the System: partition so that AmiCygnix, SDK, QT and GoldEd could be moved there. There wasn't enough room on the AmigaKit partitioned 2GB AmigaOS4 on the original hard disk for these large installations, which is why it was installed in Work: originally. So, now time to test out the Ubuntu side on the X1000. I rebooted the X1000 into Ubuntu 12.04LTS (Ubuntu Remix). If you want to know more about how to install Ubuntu Remix on the X1000 I have previously covered this here (Part 1) and here (Part 2). Once booted into Ubuntu, both NTFS partitions Work: and Music: were available with read/write access immediately on boot up, with no configuration needed at all! Fantastic! 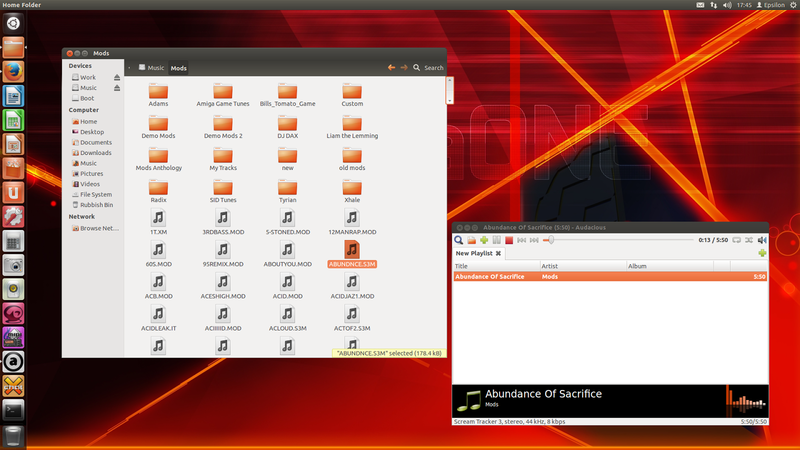 Next is the Music: NTFS partition, shown under Ubuntu. I was very happy that this worked exactly how I had planned it to! 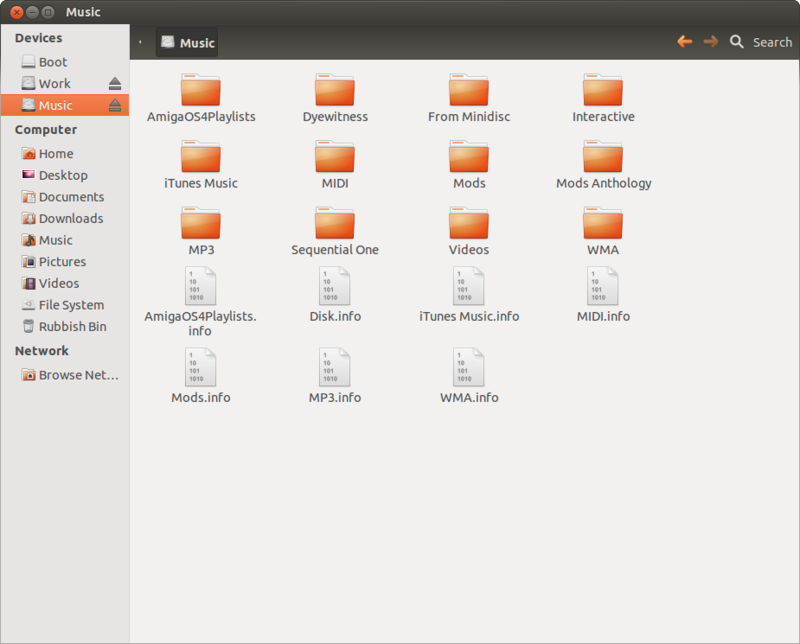 I then started copying my music, pictures and video files from the Ubuntu system partition (as they were more recent) to the shared Music drive. 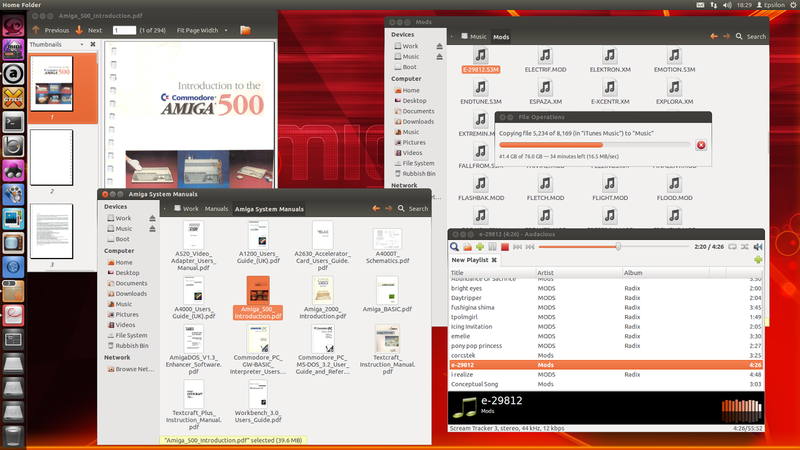 Once finished I could delete the music from the Ubuntu partition as it is no longer needed there! As you can see, the new Filesysbox NTFS partition support opens up a very convenient way to share data on NTFS partitions between AmigaOS4 and Ubuntu (or indeed any other Linux distributions that support NTFS-3G) on the X1000. As mentioned in Part 1 FileSysbox NTFS support is available for free for registered X1000 owners from AmiUpdate. There is a bit of work involved in setting it up under AmigaOS4 for fixed hard disk NTFS partition support (as I have detailed here and in Part 1), but I believe the result is worth the effort! The NTFS support is not limited to fixed SATA hard disks, and indeed works for NTFS formatted USB connected hard disks as well. I have not needed this so far and have not tried it, but it is good to know it is there if I need it! 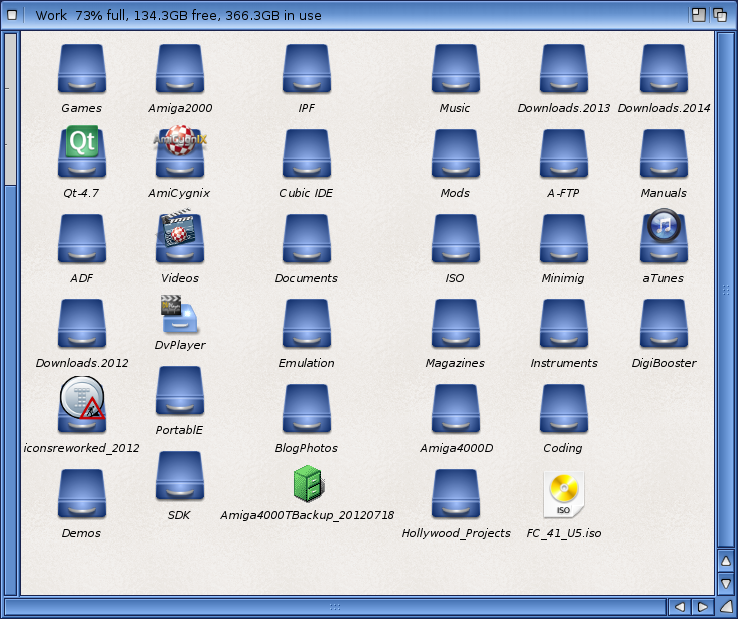 I would like to take this opportunity to say thank you very much to the developers who made this NTFS support happen under AmigaOS4 - it solved a big issue for me sharing common files between multiple operating systems on the AmigaOne X1000. 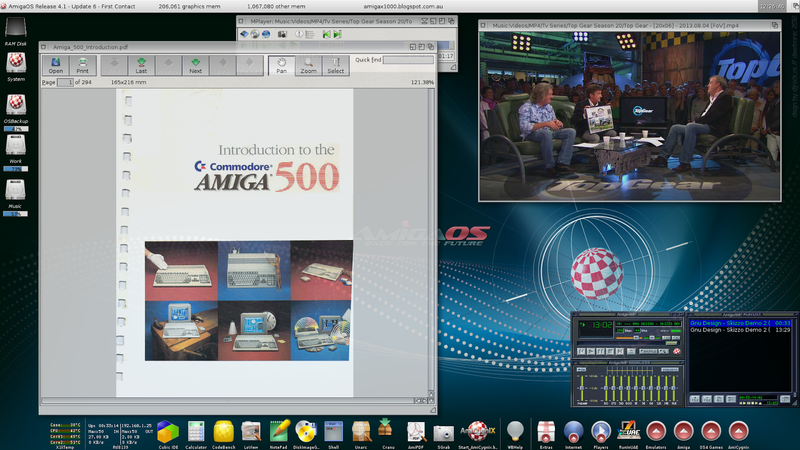 I also learnt a lot of things about the AmigaOne X1000 and filesystems in the process of setting it up!